« Do you study colour? Hot (and warm) off the press! Scientists (including Lizard Lab associate Jonno Webb) have been trying to ameliorate the impact of toxic cane toads on the threatened northern quoll. They have been doing this using taste aversion learning, where quolls are fed nausea-inducing cane toad sausages from which they develop a negative association and thereafter avoid. There is evidence that quolls are learning to avoid toads from other quolls and the plan is to disperse cane toad sausages ahead of the cane toad invasion front and thereby teach quolls to avoid toads before they encounter them for the first time. 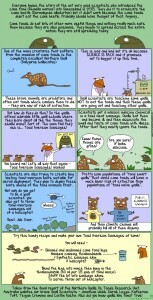 This is all captured in this amazing cartoon by First Dog on the Moon and posted on the Guardian web site. Click on image to see it in full screen.